It's been so cold that I haven't been outside except to run back and forth between the car and buildings. But that same cold has forced me to take different kinds of photos. There is a pair of woodpeckers that live nearby and love the insect filled suet. I love watching them. The cedar waxwings were back yesterday, stripping the trees of their berries. I went upstairs to the bedroom to get a better view of them and a couple of them decided to fly into the window, not sure why. After two bird strikes, I shut the blind and left them to their business. I don't want to find bodies on the ground. In the fall the juvenile waxwings come back and strip fermented berries off the trees. One day I had twenty-five drunk teenage birds hit the windows. Apparently drinking and flying is as dangerous as drinking and driving for teens. Two birds died but the rest survived. I always feel restless this time of year. I'm done with winter and want spring to come but that won't happen for awhile. My grandson is due in seven weeks and I try not to stress about what kind of father my son will be. I don't where he's living or what he's doing. He is leaving Gracie alone which is good but I worry what will happen once the baby is born. Miss Katie is doing well. I took her for a doctor appointment last week and the receptionist had never seen Katie out of her wheelchair, didn't know Katie could walk, didn't know how tall Katie was. We have a referral to a new psychiatrist who has training working with people with developmental disabilities which will be good. And we also have a referral to a geneticist. The last genetics appointment Katie had was twenty years ago and things have changed since then. The human genome has been mapped and I would still like answers. I understand that nothing can be fixed but I would still like to know what happened. Last Sunday the big guy and I took Katie out for lunch at the mall. We drove to see the horses on Fox Drive and then went to the mall. Katie ran/walked for awhile, we had lunch and then Katie sat in her wheelchair with her legs crossed and proceeded to high five everyone we walked by. I'm happy the valproic acid has helped with her anxiety and moods. She's like her old self. I enjoy spending time with my daughter again and I am so thankful. Seven weeks! How can that be? Oh, how I hope that all goes best for that baby boy you are about to take into your arms and heart. Such good news about Katie! So different than a year ago. Your photos are amazing. Truly. May it warm soon so that you'll be able to feel spring coming truly. A baby in spring. How perfect. I'm happy to hear that Katie is doing so well, and that she seems happy. I look forward to hearing about the genetic component, I totally understand your need to know. So glad to hear Miss Katie is doing well on that med regimen, our Bipolar Children were once on it and it was beneficial while they could take it in regulating Mood and of coarse Anxiety levels being stabilized as well. I Hope the Geneticist can give you some answers, sometimes we just NEED to know what went wrong even if no Cure is possible. The genetic components of so many conditions being revealed now is Helpful, maybe even one day Cures will be found as they unlock the mysteries!? And only seven weeks 'til Gramma Lily gets to meet the one who will be fresh from the Father, how exciting, even tho' I know the concerns you have are valid ones, congratulations! Grandparenting is so rewarding, witnessing our legacy in the form of new little humans is such an amazing thing! Our next Great-Granddaughter will be due in July, I can hardly wait! Wonderful photos, and I'm so glad to hear that Katie is doing well. 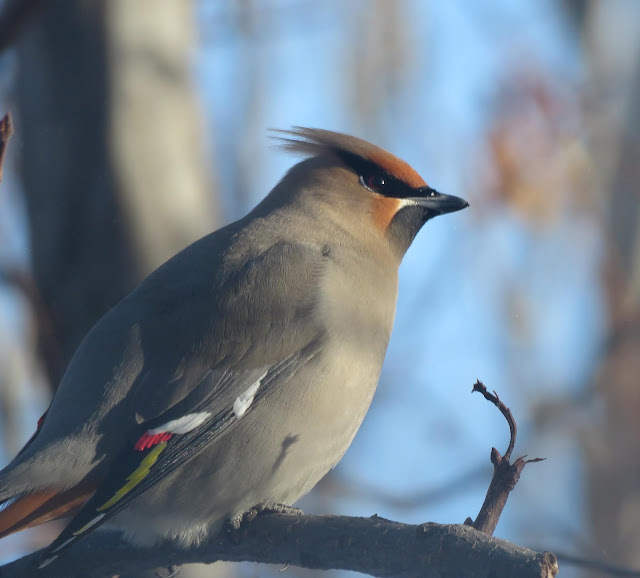 My Carl said that he thinks that's a Bohemian Waxwing, not a Cedar Waxwing. Oh Sweet Katie. A beautiful young woman at peace at last. Now that's joy. I made them for three of our windows that the birds were always smacking into. Cost? $30 for one roll of parachute cord (which doesn't tangle), and there's still some left over. I put off making them because I was afraid the cords hanging in the windows would be irritating. But they aren't. Not at all. 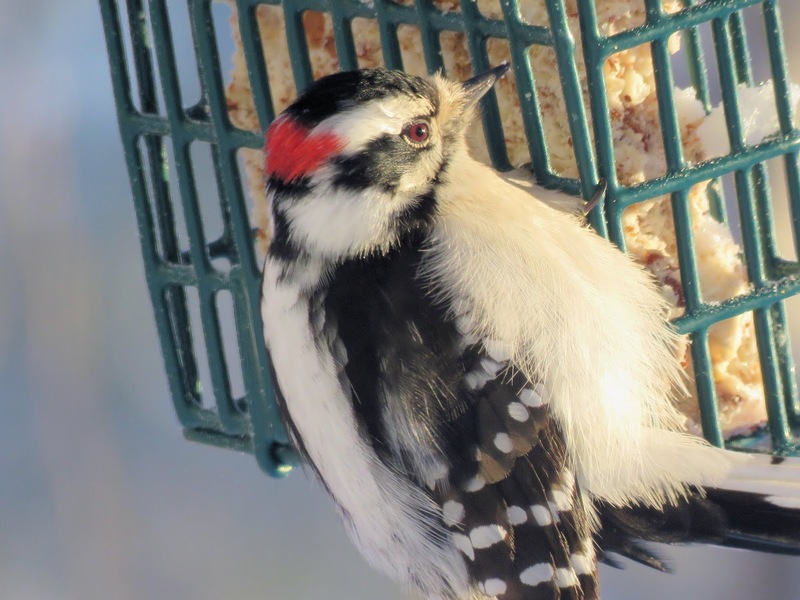 We get those woodpeckers on our suet feeders. The Cedar Waxwings are gorgeous. That all sounds so positive with Katie! That is absolutely the best news about Katie! And wow, that went fast--only seven weeks left till your grandson is born. I pray for only the good for him.